Read Manchester is delighted to be part of Bee in the City – a spectacular art event which will see a hundreds of giant bee sculptures on the streets in Manchester this summer. As part of Read Manchester, the ‘Bee a Reader’ initiative will use the buzz of the bee sculptures to encourage the whole city to spend 10 minutes reading or sharing stories every day. Families can take on the Bee a Reader Challenge to enjoy the benefits of reading this summer and beyond! The challenge includes a series of fun tasks for children, including joining the Summer Reading Challenge, writing a book review and swapping a book with a friend or sibling. Every child that completes the challenge can claim a free book at their local library. The challenge runs from 2 July to 8 September. Struggling to find the Read Manchester bee? Have a look at the little bees trail map or find out more below. Are you a buzzing creative writer? Find out more about our creative writing competition. Our friends at Chorlton High School have developed a fantastic Bee a Reader-themed challenge for older pupils to complete during the school holiday. Download the Chorlton High School challenge. 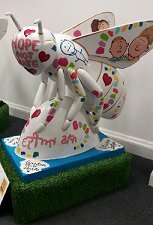 We are delighted to have a special little bee as part of the Bee in the City trail - the Read Manchester BuzzyBee Reader. Parents and carers of children at Gorton and Clayton Children's Centres discussed decorating the bee with portraits of their children, who helped out by drawing their different interests. The design also features words of advice for growing children in their many first languages. You can find the Read Manchester bee at Manchester Central Library. There are lots of ways you can be a reader this summer: pick up a book at your local library, recommend a book to a friend or commit to sharing a story with your child every day. Share your reading moments this summer on social media with #ReadMCR. The Bee in the City project follows the successful Read Manchester BookBench trail in summer 2017. Schools and community groups decorated 56 BookBenches in partnership with Wild in Art, which were displayed across the city.